Eric Roberts guest stars in S05E05 of Entourage, Tree Trippers. 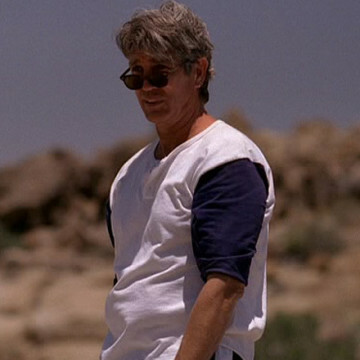 Eric portrays a reckless version of himself during the episode and agrees to tag along with Vince and his friends on a trip to Joshua Tree after he sells them a bag of mushrooms for the adventure. He is the brother of actresses Lisa (Maid in Manhattan) and Julia Roberts (Erin Brockovich), while Emma Roberts (American Horror Story) is Eric’s daughter. Roberts played Thompson in several episodes of Heroes and portrayed Maroni in 2008’s The Dark Knight.